We know how immobilized you can become with back issues. Our team of board-certified orthopedic spine surgeons is dedicated to reducing your pain and getting you moving in the right direction. We use state-of-the-art imaging technology and the most advanced back surgery techniques to treat the cause of your spinal problem. From the most complex traumatic spine injuries to more common problems like herniated disks, arthritis, spinal stenosis and sciatica, our spine specialists have the expertise and technology to address your back pain. The Bone & Joint Institute’s team of orthopedic spine surgeons collaborates with an extensive group of related specialists to get you back on your feet. Your care is supported by musculoskeletal radiologists, osteopaths, physiatrists, anesthesia pain specialists, rheumatologists and oncologists. During recovery, physical and occupational therapists support your rehabilitation and return to your life’s activities. You may also be referred to Hartford Hospital’s integrative medicine resources for alternative techniques such as acupuncture and massage therapy when appropriate. 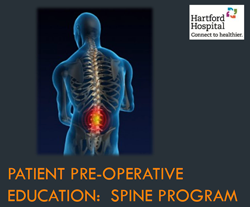 Our spine program has earned The Joint Commission’s Gold Seal of Approval™ and is designated as a Blue Distinction Center for Spine Surgery by Blue Cross Blue Shield. Our orthopedic spine surgeons use state-of-the-art surgical equipment, called Mazor X, to perform less invasive procedures and avoid the potential for later revision surgeries in complex cases. This advanced technology gives our spine surgeons the ability to pre-plan your spine surgery, and to confirm the precise placement of implants and hardware. Download our Patient Pre-Operative Guide where you'll find pre-surgery and post-surgery information.